What a fun project! Believe it or not, this project is relatively easy to make. The hardest part is cutting the paper around the closure (in the front) and the handles at the top. Other than that, it's just a matter of adhering the paper and adding embellishments. The following posts (4 cards) are part of this project/workshop held at my home - Mother's Day Workshop. Enjoy! Cut 2 pieces of Ginger Blossom designer series paper, 3" x 12". In this example, the dotted River Rock pieces are used and adhered to the bottom portion of the purse tin box. Cut 2 pieces of Ginger Blossom designer series paper, 1.25" x 12". 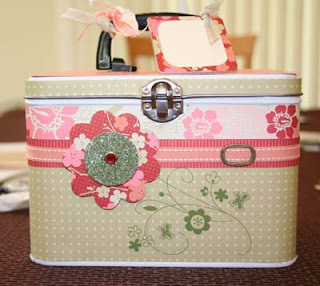 In this example, the floral pieces are used and adhered to the top portion of the purse tin box. Cut 2 pieces of Ginger Blossom designer series paper, 3/4" x 12". In this example, the Ruby Red striped pieces are used and adhered between and over the other pieces. Double Stitched Groovy Guava ribbon is wrapped around the box, with a buckle from the Hodgepodge Hardware kit (Antique Brass). Rub-ons from Love & Happiness (green) are placed on the front of the box. The chipboard (Blossoms & Basics) is covered in Ginger Blossom designer series paper. The other in Fine Cosmo green glitter (Heat-n-Stick used to adhere the glitter). The round piece is pierced with the 1/16" Circle Handheld Punch and Red rhinestone brad used in the center. Cut 2 pieces of 6/16" of Ginger Blossom paper and adhere around the top rim of the box. For the very top of the box, cut a piece of 4 15/16" x 7" piece of paper. Use corner rounder on all 4 corners. Measure and mark how far the hinges are in and how mark where they are vertically as well. Where they intersect is where the paper is to be cut (where 2 holes will be left). Cut paper in half and adhere each piece around the hinges, to the top of the box. Cut the same size piece of paper for the inside lid (not cutting necessary). Use corner rounder on all 4 corners and adhere. The chipboard at the top of the box is simply covered in designer series paper (and then Very Vanilla adhered for a greeting). This is beautiful, Heather!!! Wonderful job! So bright and cheery!